DETROIT (CNS) — The Michigan Catholic, newspaper of the Archdiocese of Detroit, will publish its last issue Aug. 24. Taking its place in November will be an online-only news service called Detroit Catholic. By comparison, The Michigan Catholic — which had paid circulation in the 30,000s in the mid-1980s and at one time owned its own printing plant — had a print run of 26,000 this year, of which only 6,000 were paid subscribers, according to archdiocesan spokeswoman Holly Fournier. The newspaper, which once was self-sustaining, required operating subsidies in the 1990s. During a restructuring of archdiocesan operations in 2009, the archdiocese said the subsidy for The Michigan Catholic would end, but Fournier told Catholic News Service Aug. 3 that while the subsidy may have been cut, it never ended, and was in fact rising in recent years. The paper switched from weekly to biweekly publication in 2010. 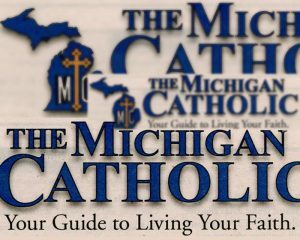 Despite The Michigan Catholic’s finances, its closure was not “about cost savings, it’s about reinvesting the resources that we have into enhanced and expanded news coverage,” Fournier said. Print, she added, “costs a lot of money. Take that money and invest it in something that will reach more people. This directive comes straight from the archbishop,” Allen H. Vigneron, whose 2017 pastoral letter “Unleash the Gospel” included instructions to all segments of the archdiocese on how to make evangelization the top priority. There is no clear word as to whether the shift will result in job losses. The archdiocese is in negotiations with the Detroit local of the NewsGuild-CWA, which represents workers at the newspaper, over the effects of the closure. In the interim between the closing of The Michigan Catholic and the debut of Detroit Catholic, news will be posted on the Michigan Catholic’s social media platforms. Subscribers will get three months of the national newspaper OSV Newsweekly and six months of the Catholic Mass edition of The Word Among Us to fill in the gap. Detroit Catholic will be free and “continue providing the award-winning news and feature stories Michigan Catholic readers expect. This transition will allow us to enhance coverage about our parishes, schools and the many life-giving ministries in the archdiocese,” Archbishop Vigneron said in an Aug. 1 letter to Catholics in the archdiocese. “Detroit Catholic will focus on serving highly engaged Catholics, clergy and lay leaders. We believe the new digital news service and website will serve these active disciples who want timely, local Catholic news, as well as current national and international stories about the church,” said Edmundo Reyes, archdiocesan director of communications, in an Aug. 1 statement.